Francois Truffaut was saved by the movies, and with this debut he came to return the favor. Unknowing of his father and passed off to other family members by his mother, growing up an unruly kid on the streets of a Paris that seemed a wonderland, never more so than at the cinema, Truffaut became a film critic as passionate as he was exacting. The 400 Blows seethes with all this but something else: This is where Truffaut only really learned just how deeply vested in cinema he could be, and you can feel how, for him as well as his young hero, there’s no going back. John Ford had John Wayne, Howard Hawks had Humphrey Bogart, Alfred Hitchcock had James Stewart (when he didn’t have Cary Grant), but while all these stars may have been manifestations of some part of the filmmakers’ self-image, none (including Orson Welles for Orson Welles) was as autobiographical an embodiment as Jean-Pierre Léaud was for Truffaut. 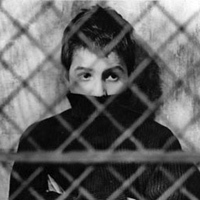 Fourteen here and, even as a boy, bearing a striking resemblance to his director, Léaud would work with Truffaut up through the actor’s mid-30s a total of five times—with many more to come if the filmmaker hadn’t died at the shockingly unjust age of 52—on each occasion playing the same character and resembling Truffaut to varying and maybe even uncomfortable degrees. If not as audacious and exuberant (or loopy and free-spirited) as 1961’s Jules and Jim (Essential Movie Library #11), this remained Truffaut’s most formal accomplishment, a revelation in its time and enduring in ours, the most perfect union of a personal statement and the French Nouvelle Vague’s conceptual considerations.